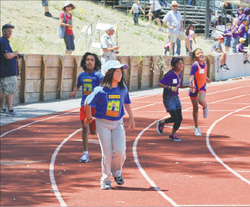 Bullis Charter School hosted more than 900 K­8 students from six Bay Area charter schools for the third Charter School Invitational Junior Olympics, held May 19 at Foothill College. Bullis Charter School initiated the event four years ago to bring the area’s charter schools together to celebrate community ￼￼￼￼￼and build closer relationships. Participating schools this year included Charter School of Morgan Hill, Livermore Valley Charter School, Magnolia Science Academy, Rocketship Discovery and Rocketship Sí Se Puede Academy. Echoing the traditions of the international Olympic Games, opening ceremonies included a performance of the national anthem by an a cappella student group, a staff and student athlete procession, and rhythmic gymnastics and color guard performances. The day’s events included running relays (100 meter), individual track events (50m, 100m, 400m, 800m and 1,600m) and field events (broad jump, shot put and javelin) and nontraditional activities such as soccer and football kicks, egg­and­spoon relays and basketball throws. Students of all ages prepared for the events since fall, discovering new passions and abilities. Students wrote letters to former Olympians inviting them to attend. Kent Mitchell, U.S. bronze (1960) and gold (1964) medalist for rowing; Dana Kirk, U.S. Olympic swimmer (2004); Paige Gordon, Canadian Olympic diver (1992 and 1996); and Eddie Parenti, Canadian Olympic swimmer (1992 and 1996) attended the event. Mitchell, wearing his gold medal and USA sweatsuit, led the Olympic Oath, and all four Olympians cheered on participants and awarded medals throughout the day. “I wouldn’t be at all surprised if there are several future Olympians in this stadium today,” Mitchell said. “This feels like we’re already in London at the real Olympics,” said one student athlete. In keeping with the spirit of fellowship and good sportsmanship, students made new friends while exchanging school­colored friendship bracelets during the course of the day. An electric torch, passed through the schools over the previous six weeks, finished its journey with a relay around the track by outstanding citizens from each school. At the end of the event, staff members competed in a relay. More than 300 staff and parent volunteers, representing all participating schools, donated more than 3,000 hours to event.